Our 3 year old program is a wonderful way for your child to start their pre-school education. Children have the opportunity to socialise and make friends with other children, eight hours per week, across 2 four hour morning sessions. We offer a high quality, child-centred program with experienced and friendly teachers and educators in a unique setting, co-located with Bonbeach Primary School. 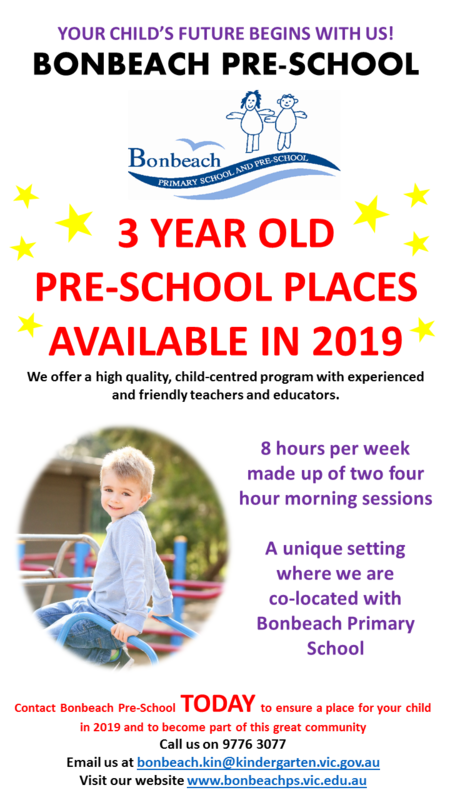 Contact the Preschool today to ensure a place for your child in 2019 and to become a part of this great community. You can download the app now for your iPad, iPhone and Android devices. Please note: Curriculum days are student free days.